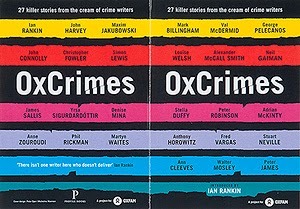 For all the lovers of crime fiction out there this Tuesday Sotheran's will be hosting the launch of OxCrimes - 27 crime stories compiled to raise money for Oxfam. Feel free to join us next week for the chance to own a great book and support an even better cause. Sotheran's will be launching a signed, cased edition of OxCrimes (of which we are the sole distributors), produced in a limited edition of 100 copies at £250.00 each. The book will be offered for a special price at the launch party (or for advance orders) for only £195.00 - so get in there quick! Oxfam and Profile are publishing a new anthology of crime short stories in order to raise a further £200,000 for Oxfam's work. The book is introduced by Ian Rankin, and includes contributions from the cream of crime writers including Mark Billingham, Alexander McCall Smith, Anthony Horowitz, Val McDermid, Peter James, Adrian McKinty, Denise Mina and Louise Welsh.